Capture of Hans van Overdam, Ghent, 1550. 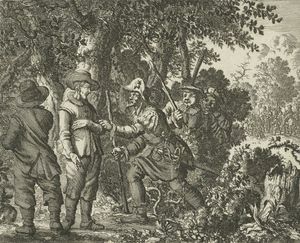 Engraving by Jan Luiken in Martyrs Mirror, v. 2, p. 89 of Dutch edition. Hans van Overdam (Overdamme), an Anabaptist martyr, executed at Ghent on 9 July 1551 (van Braght, Martyrs' Mirror, 1550), with Hans Keeskooper (Jannijn Buefkijn). He was a native of Ghent and unmarried; he had been baptized by Gillis van Aken. Already in 1545 he had been sought for heresy, and was then banished from the territory of Ghent. The Lietboecxken van den Offer des Heeren (1562, No. 17) contains a song by Hans van Overdamme in honor of Govert Mertens, Marie Vlamincx, Tanneken van Roosbroecke, and Gillis van Aerde, all of Lier, who had been executed on 31 January 1551. Hans himself is commemorated in a song, "Ick weet, die Godes woort bekent, Dat hij ter wereld moet lijden" (I know that he who confesses the Word of God must suffer in this world), also found in the Offer des Heeren. Both Offer des Heeren and the Martyrs` Mirror contain a confession by Hans van Overdamme and two letters, one sent to the congregation of Ghent, which tells how he was arrested, and one addressed to the city officials of Ghent, which, with a severity unusual among Mennonite martyrs, censures the magistrates for their false religion and their satanic persecution of the children of God. Hans and his companion Jannijn Buefkijn died steadfast. They had arranged that when they came to the scaffold Jannijn Buefkijn would slowly take off his hose, while Hans van Overdam addressed the crowd assembled around the place of execution; this they did. Thereupon they suffered death, each bound at a stake. A novel by Kristen Loer, Strijd om het geluk (1949), has Hans van Overdamme as its principal character. Braght, Thieleman J. van. Het Bloedigh Tooneel of Martelaers Spiegel der Doopsgesinde of Weereloose Christenen, Die om 't getuygenis van Jesus haren Salighmaker geleden hebben ende gedood zijn van Christi tijd of tot desen tijd toe. Den Tweeden Druk. Amsterdam: Hieronymus Sweerts, 1685: Part II, 86 f.
Braght, Thieleman J. van. The Bloody Theatre or Martyrs' Mirror of the Defenseless Christians Who Baptized Only upon Confession of Faith and Who Suffered and Died for the Testimony of Jesus Their Saviour . . . to the Year A.D. 1660. Scottdale, PA: Herald Press, 1951: 486 ff. Available online at: http://www.homecomers.org/mirror/index.htm. Dit Boec wort genoemt: Het Offer des Heeren, om het inhout van sommighe opgheofferde kinderen Godts . . . N.p., 1562, 1567, 1570, 1578, 1580, Amsterdam, 1590, n.p., 1591, Amsterdam, 1595, Harlingen, 1599: 98-120, 565, note 4. Hege, Christian and Christian Neff. Mennonitisches Lexikon, 4 vols. Frankfurt & Weierhof: Hege; Karlsruhe: Schneider, 1913-1967: v. II, 69; v. III, 283, 331. Verheyden, A. L. E. Het Gentsche Martyrologium (1530-1595). Brugge: De Tempel, 1946. 15: No. 27. Wackernagel, Philipp. Lieder der niederlandischen Reformierten aus der Zeit der Verfolgung im 16. Jahrhundert. Frankfurt: Hender & Zimmer, 1867. Reprinted Nieuwkoop : B. de Graaf, 1965: 126. Wolkan, Rudolf. Die Lieder der Wiedertäufer. Berlin, 1903. Reprinted Nieuwkoop : B. De Graaf, 1965: 63, 78. Zijpp, Nanne van der. "Hans van Overdam (d. 1551)." Global Anabaptist Mennonite Encyclopedia Online. 1956. Web. 21 Apr 2019. http://gameo.org/index.php?title=Hans_van_Overdam_(d._1551)&oldid=162644. Zijpp, Nanne van der. (1956). Hans van Overdam (d. 1551). Global Anabaptist Mennonite Encyclopedia Online. Retrieved 21 April 2019, from http://gameo.org/index.php?title=Hans_van_Overdam_(d._1551)&oldid=162644. Adapted by permission of Herald Press, Harrisonburg, Virginia, from Mennonite Encyclopedia, Vol. 2, p. 651. All rights reserved. This page was last modified on 15 December 2018, at 13:24.